Police eventually held back the crowds to relocate Hoppenstein, which resulted in 20 students filing charges of police brutality. 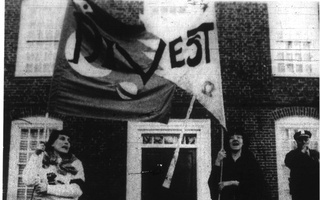 The Lowell House blockade marked the peak of the anti-apartheid protests in the mid-1980s, resulting in disciplinary action for more than a dozen students. Students from the Southern Africa Solidarity Committee (SASC) staged the protest as part of their efforts to push President Derek C. Bok to divest Harvard’s endowment from companies conducting business with the apartheid government in South Africa. Though Harvard never fully divested from South Africa, the protests forced the administration to grapple with its role in indirectly financing the apartheid regime, and made a deep impression on the student participants, who said their lives were shaped by the turbulent events. Anti-apartheid protests began in Cambridge as early as the 1970s and steadily gained momentum, leading to a student take-over of Bok’s office and a torchlight parade in opposition to Harvard’s investments in South Africa in 1978. But according to Damon A. Silvers ’86, one of the leaders of SASC, the committee was dormant in the early 80s during a period of relative quiet in South African resistance. As the situation in South Africa became increasingly dire, however, student support for the end of violence in South African grew rapidly. “We felt Harvard University should not be another brick in the wall of apartheid,” said Jamin B. Raskin ’83, who participated in the 1985 protests while at the Law School. On April 4, 1985, about 5,000 students gathered in Harvard Yard for a protest organized by SASC, which had invited Reverend Jesse I. Jackson to speak to the riled crowds. Jackson had written a letter to Bok a month earlier in which he urged the University to divest. The rally was only the beginning of the passionate resurgence of anti-apartheid protests in 1985. That year, protestors would occasionally stage “pop and stops”—activities to prove that they were well-organized enough to seize control of a major administrative building if necessary. Massive groups of students would instantly materialize and pile into the offices of Massachusetts Hall, where they handed the secretaries flowers and mysteriously said, “We’ll be back later,” before quickly dissipating. Students also created an alternative fund to collection donations from the senior class that would not be invested in South Africa. Thomas J. Winslow ’87 said that his role in the anti-apartheid movement propelled him to write a senior thesis about marriage laws in repressive societies, including apartheid South Africa. After graduating from Harvard, Winslow decided to study at the University of Cape Town. He later established a psycho-social programme for released political prisoners, before co-founding a trauma center for survivors of torture and political violence. Now, Winslow and Morifi are married and live in Johannesburg with their two children. “Perhaps it was a strange twist of fate—Harvard’s failure to disinvest, shanties in Harvard Yard, the fellowship programme for black South Africans, and my academic interests—that eventually brought us together,” Winslow wrote in an e-mail to The Crimson. Today, Winslow interviews South African high school students applying to Harvard. “It’s as important as ever that young gifted South Africans have the same opportunities to join the Harvard undergraduate community—not as historically disadvantaged victims of apartheid, as they might have been characterised in the past—but as intellectual equals to any other global candidates for admissions,” Winslow wrote. Raskin said that alarming levels of corporate misconduct have influenced the current generation of students—from the Massey Energy Corporation in West Virginia, to BP Oil in the Gulf of Mexico, to Goldman Sachs on Wall Street. “When I look at the state of the world today, it seems a lot more frightful and perilous than when I was in college,” he said. Raskin added that young people’s enthusiasm and organization around President Barack Obama’s campaign is proof that students today are still eager to be politically active. In 2001, strong student organization was evidenced, when undergraduates staged a sit-in to urge the University to pay its employees a living wage. 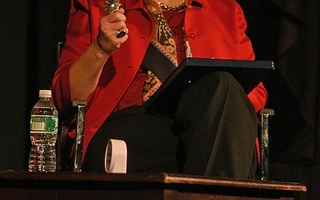 Silvers was involved in some of the negotiations between students and administrators as a third-party labor representative. Silvers said that his experience as a witness in disciplinary hearings in 2001 with the once-again resurrected CRR created a feeling of “déjà vu,” bringing back memories of his own experience with the CRR in 1985. According to Winslow, global poverty and achieving the Millennium Development goals are the most pressing issues for today’s students. —Staff writer Zoe A. Y. Weinberg can be reached at zoe.weinberg@college.harvard.edu.